NEW Kiwanis 5th Tuesday Networking and Social Meeting! NOTE: THERE IS NO KIWANIS LUNCHEON MEETING THIS DAY! First drink is on us (Members Only)! Appetizers will be served. In partnership with Bold Events and Catering. Philanthropy in the Classroom is a program designed to familiarize elementary school children with the concept of philanthropy. We are very excited about expanding our program and will need around 70 volunteers to cover each class. Once you sign up, you will receive more information. There is a general training for all volunteers on August 28, 2018, following out Kiwanis Club luncheon. For further information about the program, email picatlanta@gmail.com or Stacey Sapp, stacey.sapp@acfb.org. The link to sign up to volunteer is pic2018.eventbrite.com. Please note: A background check is required for all Kiwanis volunteers. If you are interested in participating, please check with Karen Losin to be sure your background check is current. Applications for a 2018 Grant from the Kiwanis Foundation of Atlanta will open on July 30, 2018. The Foundation was founded in 1953 as a nonprofit organization to raise funds from members of the Kiwanis Club of Atlanta to provide financial support to charitable institutions in which the Club has an interest. A major commitment of the Foundation is to provide ongoing support for organizations serving the needs of children and youth in our community. 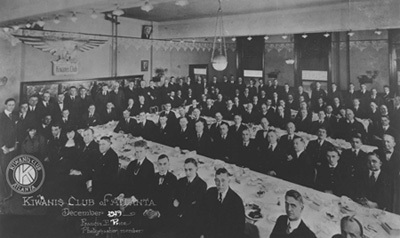 Priority is given to organizations within metropolitan Atlanta, and no grants are made outside the state of Georgia. 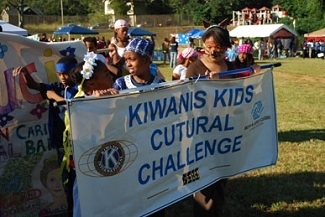 Active involvement of a current member of Kiwanis Club of Atlanta is preferred. Grants are typically in the range of $1500 to $3500. Grants are not made to private, primary, or secondary schools, or to individual churches or congregations. 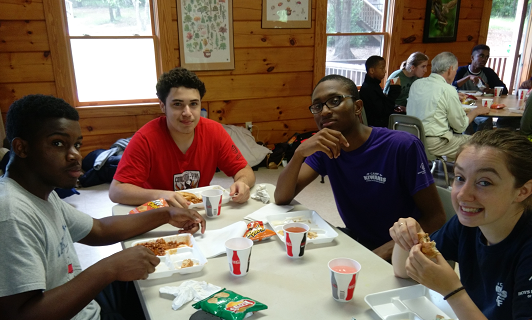 The Foundation does not have a religious purpose, but does permit grants to organizations with a religious affiliation for programs serving underprivileged youth. If you would like to receive a grant application packet, AFTER JULY 30TH, you can download one from the website or contact KiwanisClubAtlanta@gmail.com. DEADLINE: GRANT APPLICATIONS MUST BE POSTMARKED BY, TUESDAY, AUGUST 28, 2018 OR RECEIVED IN THE OFFICE BY NOON ON THURSDAY, AUGUST 30, 2018. NO EXTENSIONS. Beginning on Tuesday, May 29th, our club's luncheon meetings will feature a new buffet format, enabling members and guests to choose from both hot and cold items. All current hot and special meals that you may be getting will be discontinued unless you notify the office by May 24th. Again, if you have any dietary restrictions, or would like to continue to receive a portioned hot meal, please notify KiwanisClubAtlanta@gmail.com by May 24th. This new lunch buffet will be a great way to enjoy the foods you like and provide the flexibility to folks as they arrive at various times. In addition to the lunch buffet option, from time to time, we will have our lunch in the Ann Cramer Room, on the 2nd floor of the Loudermilk Center. It is a more intimate meeting space and makes our group look HUGE! If the Loudermilk Center is able to sell the Ballroom space for a price that covers our lunch and nets them a profit, then they will do it. There are several of our larger meetings that we have each year that are protected and will never move. So no worries there! We thank all of you for your support and understanding and helping us to maintain a good relationship with the Loudermilk Center and the United Way of Metro Atlanta.